I like having a few easy smoothie recipes memorized, ones where I always have the ingredients ready to go. Sometimes it’s because I’m rushing, need a snack, or am simply feeling a bit lazy (when I’m feeling more motivated, I love a good smoothie bowl. Be sure to check out my Acai Berry Smoothie Bowl. More on these below). 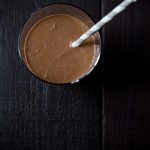 Chocolate and peanut butter is one of my favorite flavor combinations, so this smoothie has been a staple of mine for quite some time. I can keep it reasonably light, or up the protein so it functions as a meal replacement. The nutritional content in this recipe is valid if you use regular peanut butter, but I’ve recently become a huge fan of dehydrated peanut powder. Not the ones like PB2, which include sugar and other unnecessary ingredients. There are several brands of peanut powder that are actually nothing but dehydrated peanuts. I found one at Whole Foods called Crazy Richards Pure PB, and now buy it in bulk on Amazon where it’s much cheaper. Two tablespoons is only 50 calories and 1.5 grams of fat! It also has 6 grams of protein. I like adding a touch of protein powder as well sometimes if I’m having the smoothie in place of an actual breakfast. Stay away from this if you’re vegetarian, but I love Vital Proteins Collagen Powder. One scoop has 9 grams of protein (you can use up to two scoops), and is totally flavorless. I skip this step if I’m having the smoothie as a snack. I don’t have a specific brand recommendation for a vegetarian protein powder, but I recommend using something that’s unflavored and unsweetened so it doesn’t interfere with the other ingredients. Cutting back on the liquids is the easiest way to thicken a smoothie. You can also increase the thickening agent. For a thicker smoothie, try cutting the milk back to 3/4 cup or less, and/or using a larger banana. You can froth up a smoothie by adding a handful of ice, which is helpful if you’re not starting with a frozen banana. Make sure to drink the smoothie ASAP, or you’ll wind up getting the opposite effect when the ice melts! (Sorry if that one was too obvious). If you’re using regular nut butter as opposed to the powdered version, you can swap out the peanut butter for cashew or almond butter. Cashew butter is one of my favorites! Try my homemade cashew butter or almond butter if you’re into DIY pantry staples. I prefer using milk (usually 2%) over yogurt in this recipe. While yogurt is a great smoothie thickener, I think it adds too much tang here, and the flavor clashes with the chocolate and banana. But you can absolutely swap in yogurt if you prefer. Have you ever had a smoothie bowl? I thought they seemed gimmicky until I tried one myself. Now I’m a fan! Check out my green berry granola smoothie bowl for an example. I like cereal (and yogurt with toppings), and smoothie bowls are basically the same thing but with a smoothie base. It’s an opportunity to add texture with complimentary flavors. For a chocolate peanut butter smoothie, some great toppings would be sliced bananas, chopped, roasted nuts, granola and maybe some cacao nibs. Maybe with a bit of honey drizzled on top. Be sure to check out my simple overnight oats and banana millet breakfast porridge! Is it breakfast or dessert? 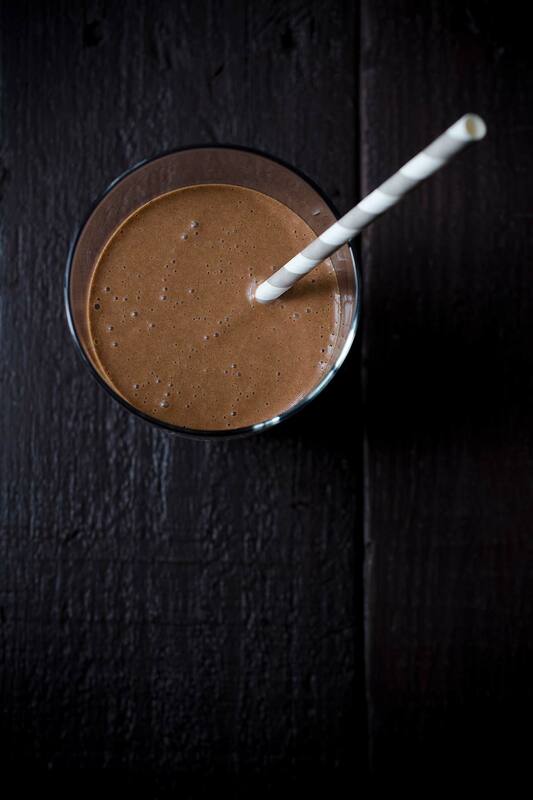 You'd never know that this Banana Chocolate Peanut Butter Smoothie is actually good for you! 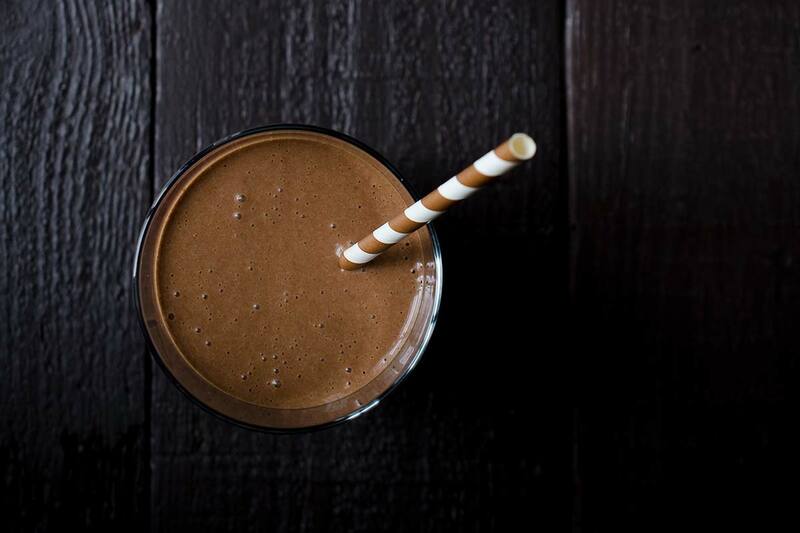 Puree the banana, milk, cocoa powder, peanut butter, and honey in a blender. Taste and add more sweetener if desired. To cut down on the calories and fat, I prefer using peanut butter powder in this recipe. The nutritional info in this recipe references regular peanut butter. For added protein, I almost always add Vital Proteins Collagen Peptides. Please not that this is not a vegetarian protein powder, but is completely flavorless. If you want to add additional sweetness without using honey or agave nectar, you can add 1/2 a chopped apple (I don't bother peeling it, but you might want to since the peel adds some texture). Another option would be a few drops of liquid Stevia. Chocolate and peanut butter is my kryptonite!